When most people think about weight loss, they immediately think of diet and exercise. The mistake with that perception is that it ignores the underlying causes that may be the reason for obesity in the first place. An article in The British Journal of Health Psychology described perfectly why weight loss is such a struggle: “The behavioral analysis of weight loss management is complex. Food intake and physical activity are affected by a complex system of interacting societal, policy, community, social, economic, and individual factors.” (Sniehotta, Simpson, & Greaves, 2014) Because success is hinged on so many factors, losing weight can be a difficult process. It helps to see the big picture in order to succeed. Skinner showed how positive reinforcement worked by placing a hungry rat in his Skinner box. The box contained a lever on the side and as the rat moved about the box it would accidentally knock the lever. Immediately it did so a food pellet would drop into a container next to the lever. The rats quickly learned to go straight to the lever after a few times of being put in the box. The consequence of receiving food if they pressed the lever ensured that they would repeat the action again and again. That scenario may sound familiar since it is how many parents reward children for good behavior. When a child acts favorably they get a treat, usually in the form of food. We learn young to relate food with behavior, and this becomes ingrained in us. As adults, we often reward ourselves with food, thus contributing to our unhealthy perception of looking at food as an indulgence instead of nourishment. Obesity is a wide spread epidemic across the country. 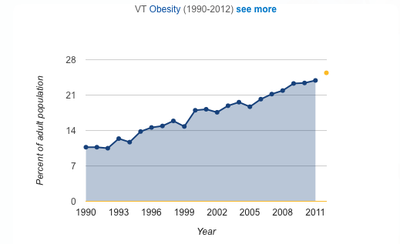 According to the State of Obesity (2015), “Vermont’s adult obesity rate is currently 25.1 percent, up from 17.0 percent in 2000 and from 10.7 percent in 1990.” The following image shows a steady increase from the years 1990 to 2012. When I interviewed Jonathan Billings, Vice President of Planning at Northwestern Medical Center, which funds RiseVT, I learned about a program that has been instrumental in my own journey of successful weight loss. Q. What is RiseVT and what prompted its creation? A. Every three years a community health needs assessment is done. Obesity was the number two concern in our region. From that came the idea for RiseVT, which is a community collaborative to embrace healthier lifestyles and improve the quality of life. Q. What are the main focuses to help people reach their goals? A. We focus on engaging in physical activity and making better nutrition choices. More importantly, we want to make the healthy choice the easy choice. Q. How do you believe the social aspect of RiseVT helps people stay consistent? A. The program is based on a social ecological model starting with the individual. We also work behind the scenes to affect the other models. We gear activities toward families because if the individual doesn’t have support of their family they won’t succeed. We also work with schools and businesses to make sure there are healthy choices in cafeterias. We encourage physical activity so we look into whether or not there are sidewalks or walking paths available. Q. I’ve seen online that the program offers the use of a health coach. Are these health coaches trained in aspects of psychology? A. We have one formal health coach and a team of special advocates made up of partners and volunteers. They come from varied backgrounds and training. Mostly stemming from physical activity and nutrition. Though through our partnerships we can connect people with other professionals if that is what they need. We have a multitude of systems in place in order to help people be successful. I first heard of RiseVT from a Facebook post. I had been concerned about my weight and overall health since having twins in 2015. Nutrition and exercise had never interested me, but as a thirty-six-year-old woman with four children it was time to work for it. Since I couldn’t afford a gym membership at the time, I vowed to use the free tools online that were provided to help me reach my goals. After taking an online health assessment, I set my personal goals for weight and physical activity and was given a target number for daily calories. The most beneficial aspect for me personally was the social connection. Each day when I logged onto Facebook I saw a motivational post. At work I saw my friends and community members joining in as well. This program helped me to lose 25 pounds, gain more energy, and improve my overall health. It is clear that the support of RiseVT has helped many individuals, families, and communities make better choices for their health. Being surrounded by like-minded people and having the support of a group makes a crucial difference. Having all the tools to help you succeed in one place is invaluable. By recognizing that the journey of weight loss is a mental and physical challenge, RiseVT has a positive effect. I hope after seeing the progress made in Franklin and Grand Isle counties that this program eventually expands statewide. This entry was tagged B. F. Skinner, food as reward, Franklin and Grand Isle Counties, health coach, Jonathon Billings, Northwestern Medical Center, physical activity and nutrition, RiseVT, Vermont obesity, weight loss, weight loss programs. Bookmark the permalink.